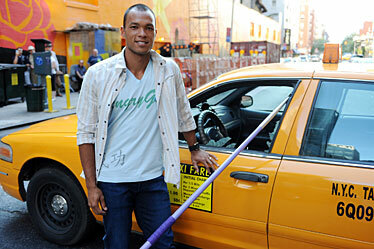 U.S. Olympic decathlon gold medalist Bryan Clay, a Castle High graduate, stands next to a taxi after breaking its window with a javelin outside the Ed Sullivan Theater for a taping of "Late Show with David Letterman" yesterday in New York City. This weekend Kamehameha begins a two-game stint with mainland football foes. On Friday, the fourth-ranked Warriors will host St. John Bosco (Calif.). Next week, they travel to Utah for a battle with Kaysville. Also on Friday, King Kekaulike takes flight to Florida -- coach J.W. Kenton's stomping grounds -- for a game with Bay. Na Alii will have enough time and tickets to scoot over to Gainesville the next day, where the University of Florida opens its season against Hawaii. Baldwin, a state semifinalist in four of the past five years, will host Mission Viejo (Calif.) on Friday. Hawaii-Hilo junior Kelly White was selected the Pacific West Conference women's soccer preseason Player of the Year yesterday. Joining White on the first team is teammate Vanessa Butin, Brigham Young-Hawaii's Natasha Aiono and Sarah Welty, Chaminade's Marissa Minor and Marisa Faye and Hawaii Pacific's Lauren Avenue, Veronica Ellmann and Jamie Hirai. » Tebow vs. who knows?